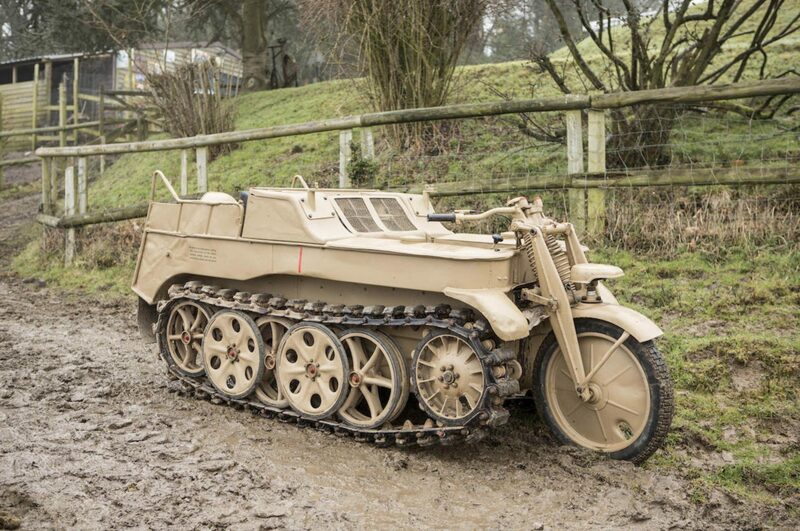 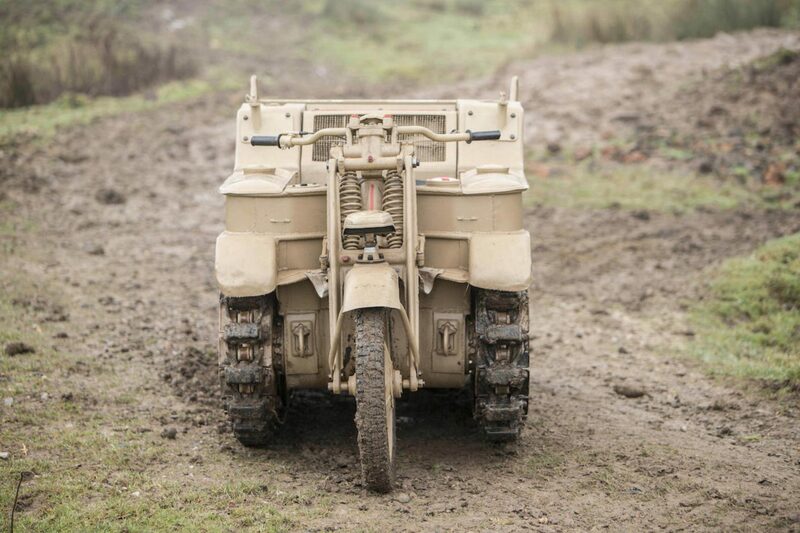 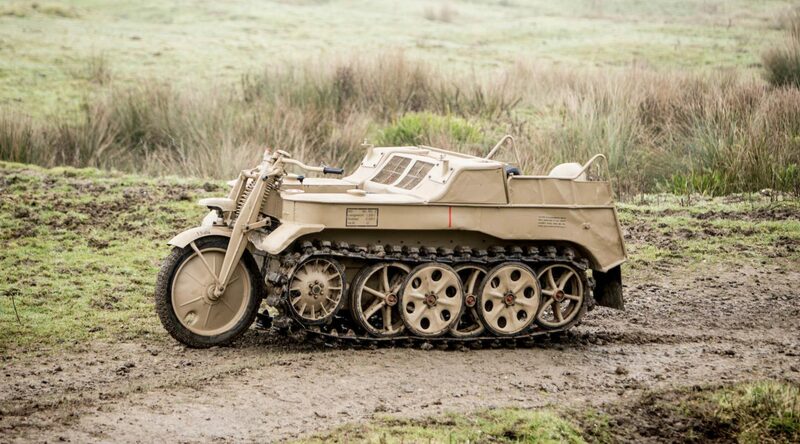 Designated “SdKfz 2” by the German military but more commonly known as the “Kettenkrad”, the tracked motorcycle was used extensively on both the Eastern Front and the North African desert, and it retains the historical distinction of being the fastest tracked vehicle of the Second World War. 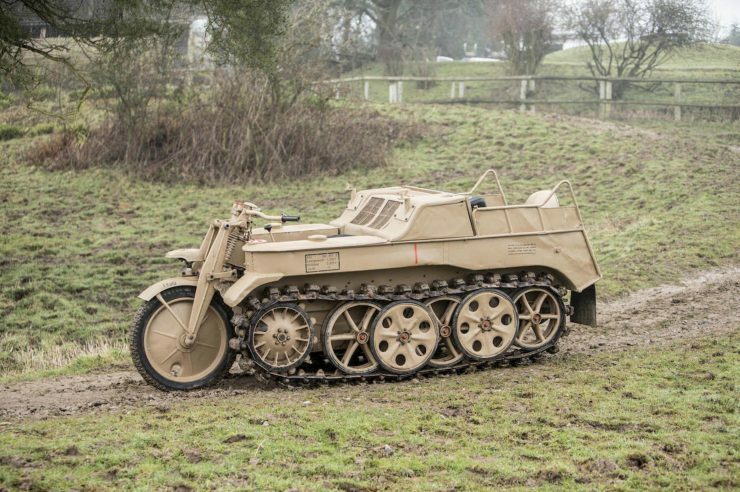 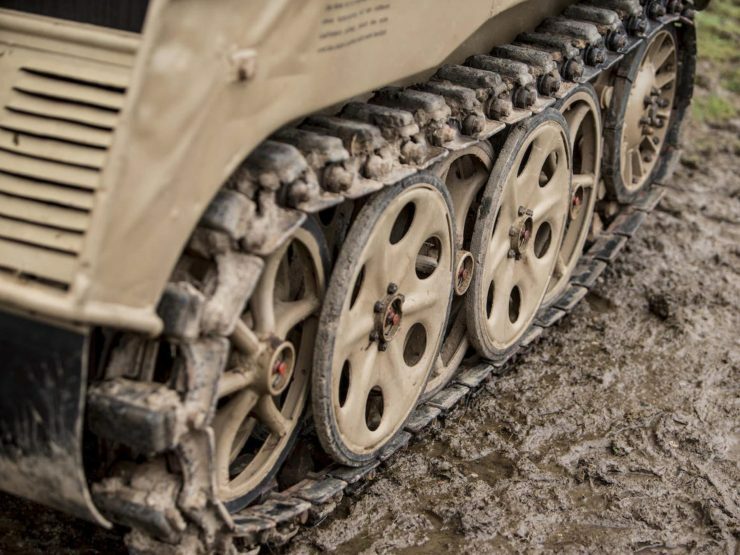 The top speed of 50 mph may not sound particularly impressive, but it’s enough to shake your teeth loose even on the smoothest of roads, and the German Wehrmacht recommended the slightly more restrained top speed of 44 mph. The SdKfz 2 Kettenkrad was originally designed to fit inside the Junkers Ju 52 transport aircraft for rapid deployment, though for obvious reasons it was never deployed by parachute. 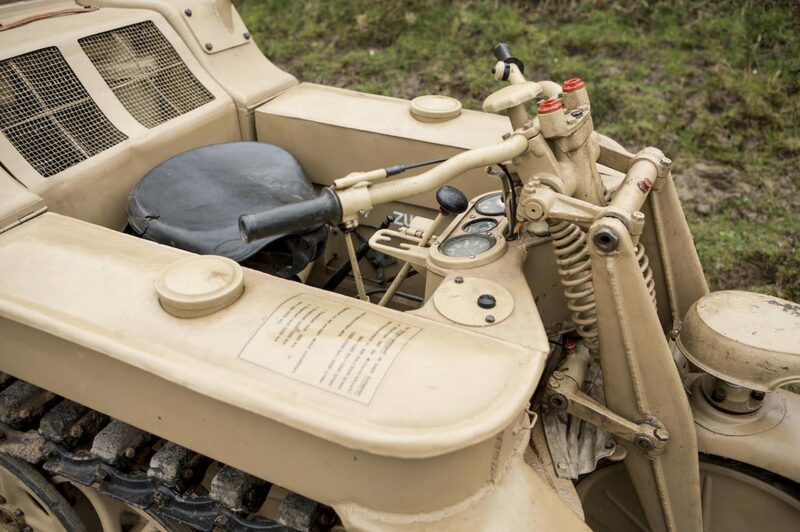 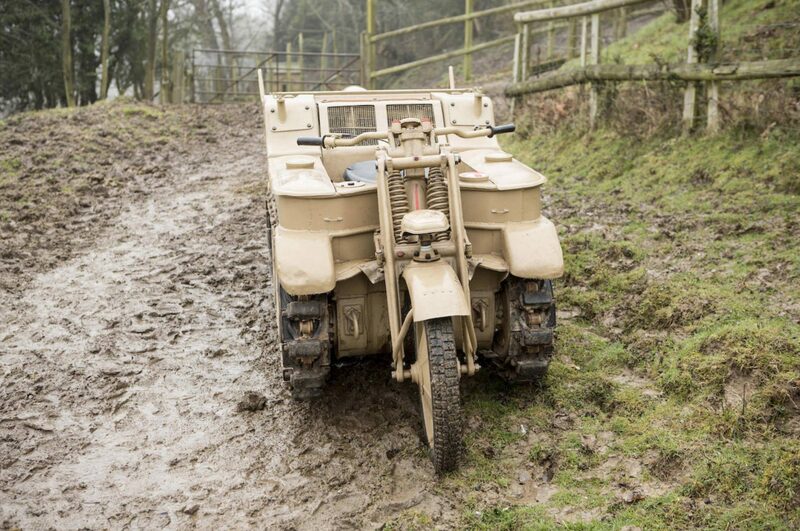 Although it wasn’t light by motorcycle standards, it was a featherweight when compared to other tracked vehicles of the war. The German military used the Kettenkrad as a troop transport – particularly in the treacle-like Russian mud or the thick sands of the Sahara. 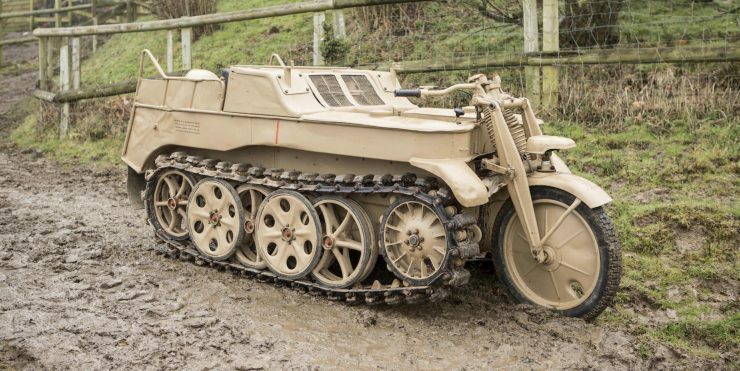 Other uses included work as a gun tractor, a cable layer, and a runway tug for Luftwaffe aircraft – usually the Messerschmitt Me 262 jet fighter, and occasionally the Arado Ar 234 jet reconnaissance-bomber. 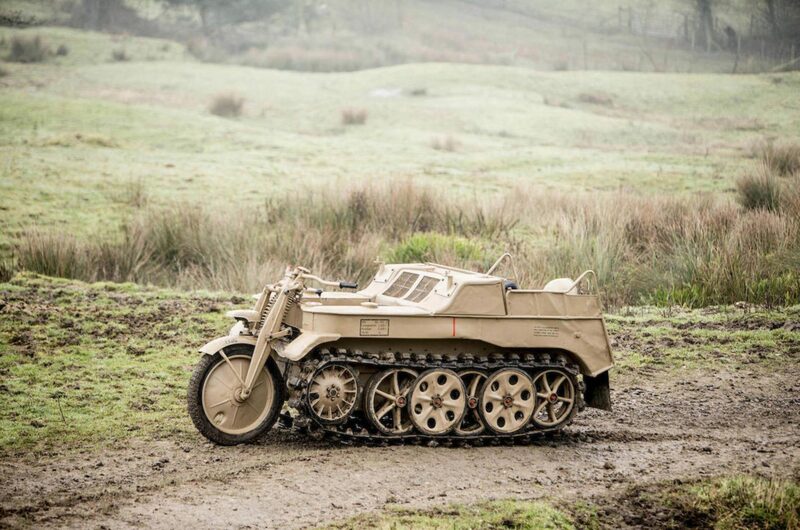 This Luftwaffe use was more common at the end of the war when aviation fuel was scarce, the SdKfz 2 Kettenkrad would be used to tow aircraft right to the runway and minimise fuel wastage on taxiways. The designers chose to use the 1478cc inline-4 water-cooled unit from the Opel Olympia car that was in use throughout the German military. 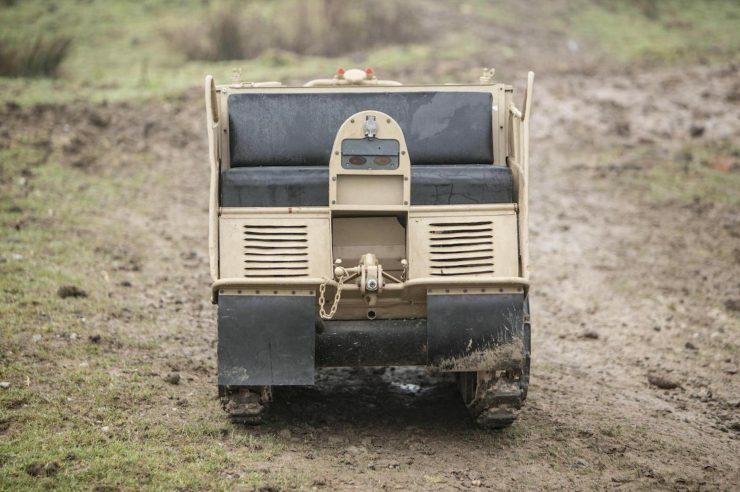 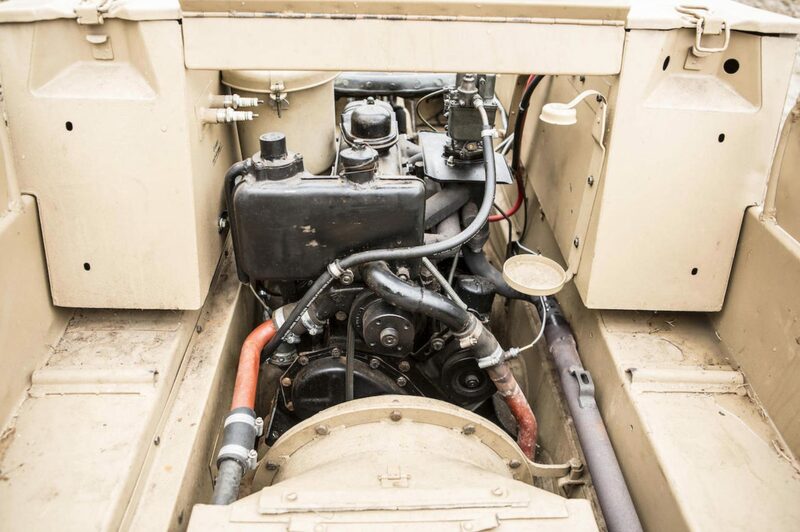 This would simplify parts availability and the training required for mechanics, besides which it was a known engine with known capabilities, and it would require no re-tooling to produce. 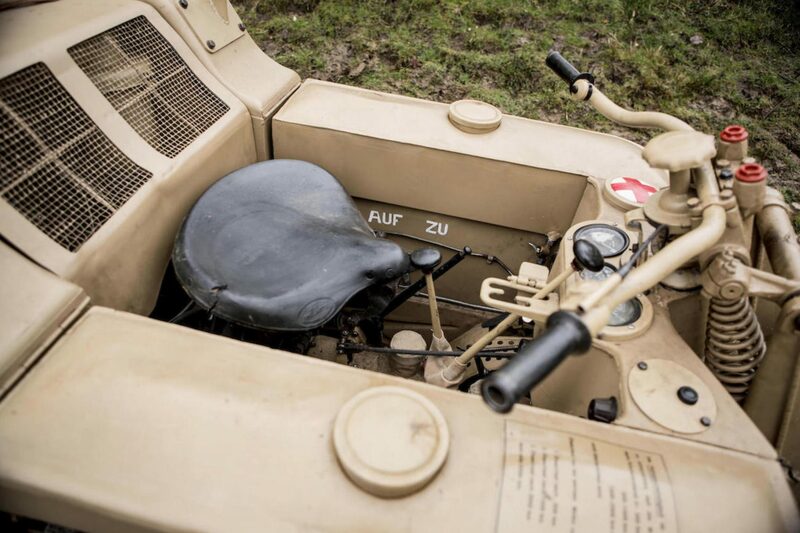 With a power output at a relatively modest 36 bhp, the Opel engine was mated to an automotive 3-speed transmission with a foot clutch and a stick shift, with both high and low range. 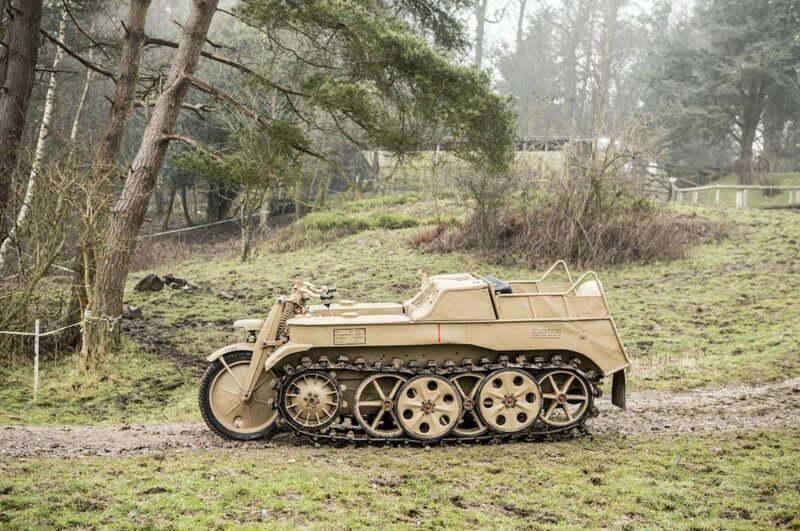 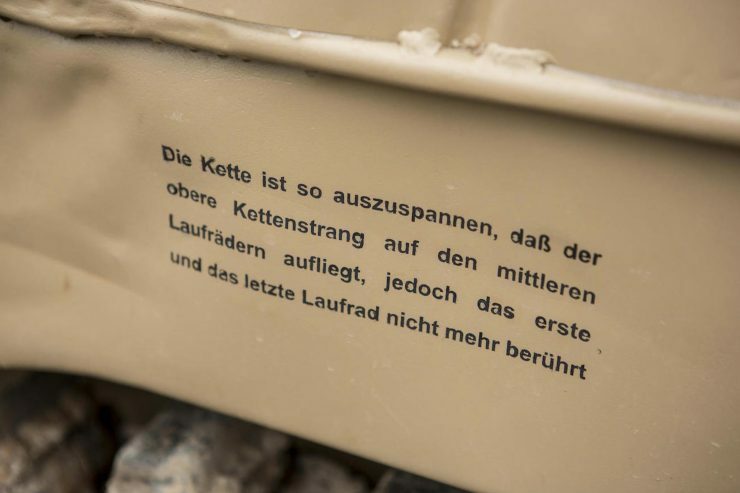 This gave a total of 6 speeds, and in low range it’s said that the Kettenkrad can climb remarkably steep inclines – even 24° or more in deep sand. 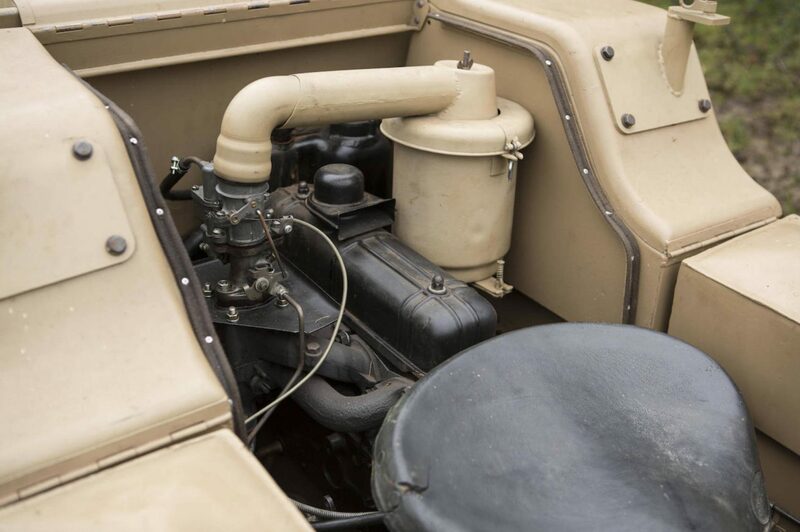 The first question most ask about the Kettenkrad is related to steering. 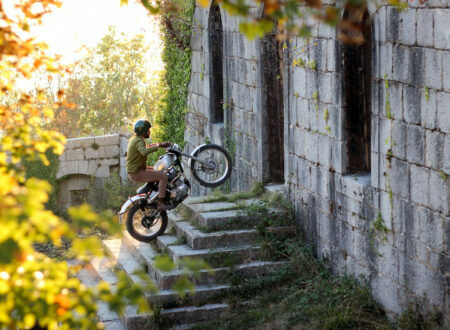 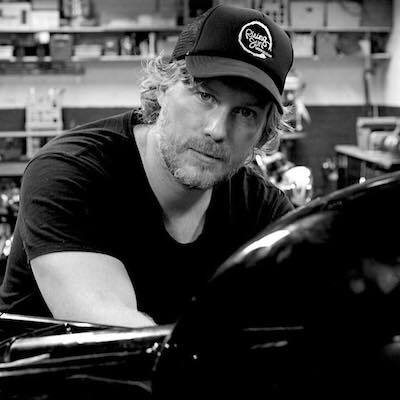 That motorcycle front-end looks incapable of much in the way of direction change – but it is surprisingly effective. As you turn the handlebars to an almost locked position the tracks are stopped on the side of the turn, allowing for tight turns even in thick mud and sand – much the same as a normal tank steers. 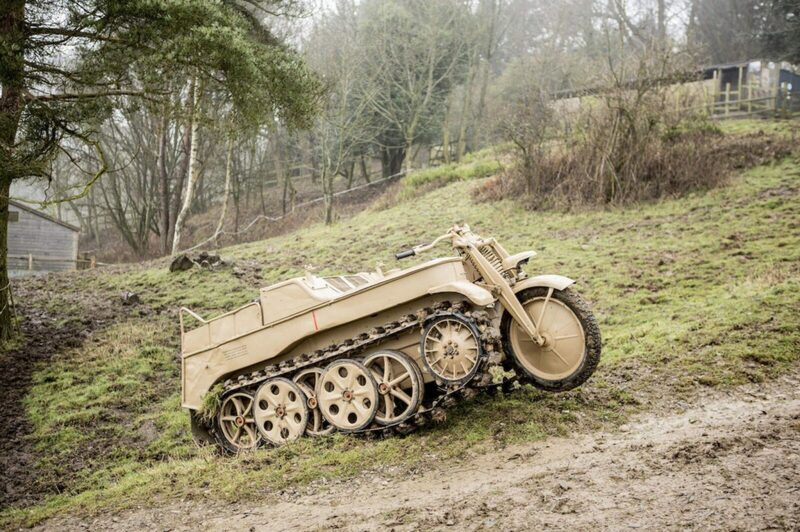 Some Kettenkrads did away with the motorcycle front end entirely – and just steered by track braking. By the time production stopped in 1944 8,345 had been built, and in post-war Germany most of them were scrapped for steel as the country demilitarised. 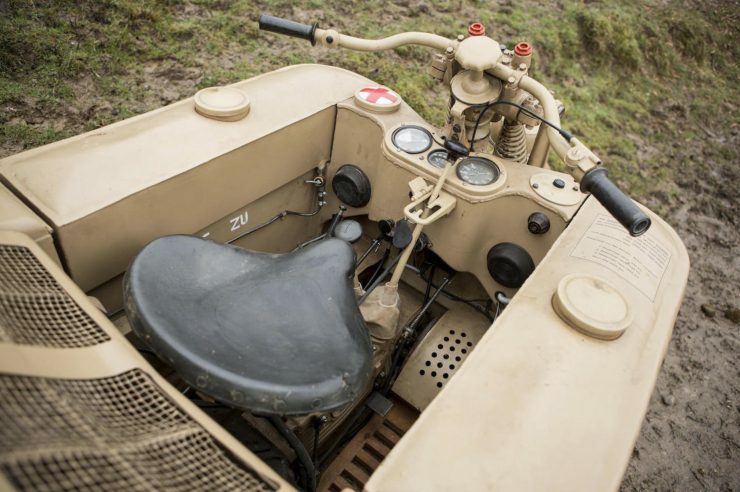 The few surviving examples are highly sought after by collectors, and it’s not known exactly how many have survived to the modern day. 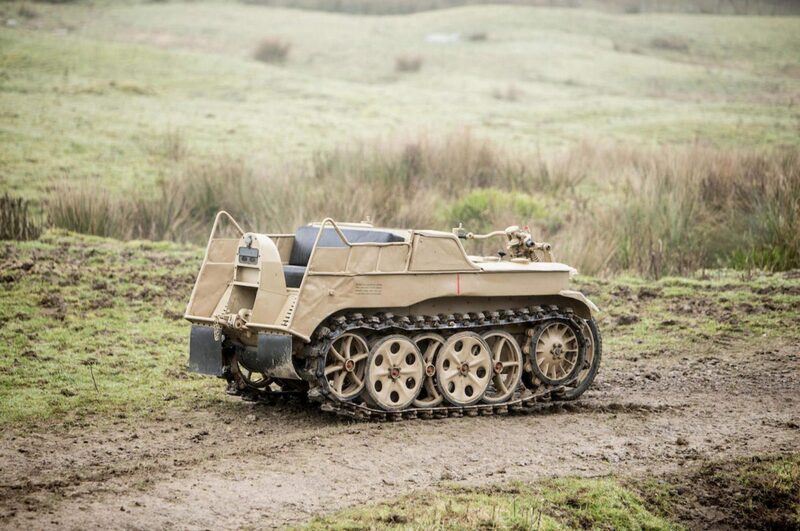 The SdKfz 2 Kettenkrad you see here is a 1944 example from the final year of production, it has little known history, but it is known that it was used by the German Forestry Commission in the years after the war. 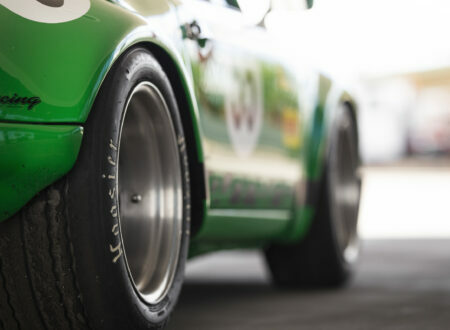 It was purchased from an owner in Belgium as a restoration project, and it was given a full nut-and-bolt rebuild between 2011 and 2015 – including a full engine rebuild, and a rebuild of the drivetrain including gearbox, differential, and final drive. 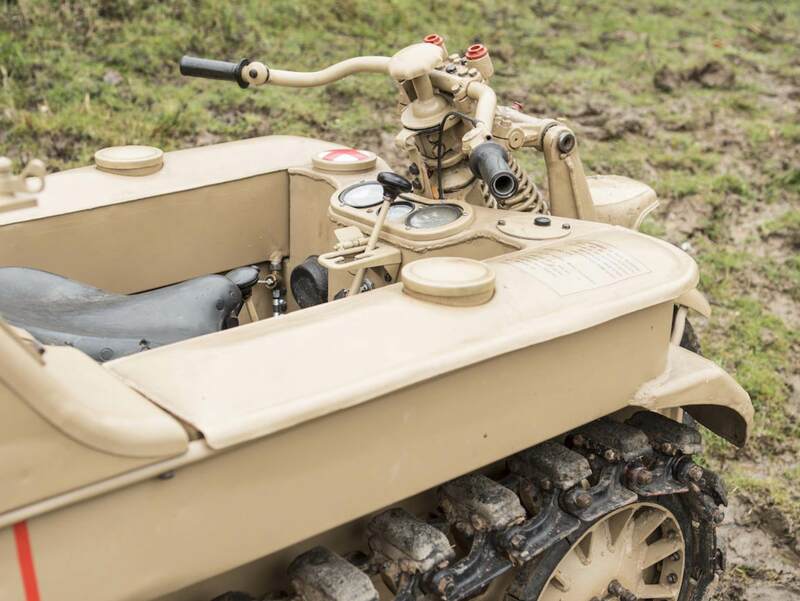 It’s now accompanied by a number of bills and 250+ images of the restoration process, as well as its original 6-volt electrical system and just 10 hours of running time since the restoration was completed. 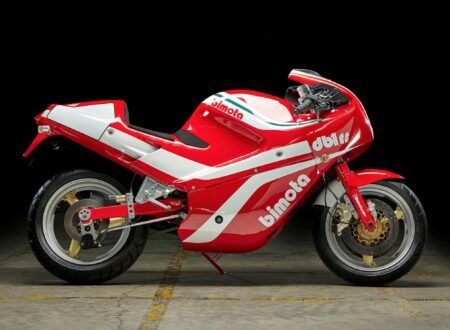 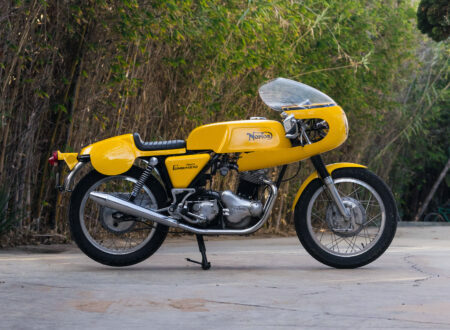 It’s due to roll across the auction block with Bonhams on the 19th of March with an estimated hammer price of between £60,000 and £80,000. 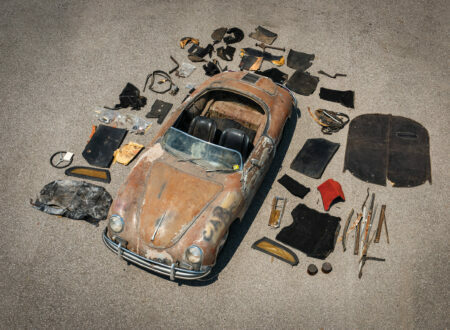 If you’d like to read more about it or register to bid you can click here to view the listing.